Before anyone gets ahead of themselves, the slowboat is not the same as the shortbus. Although, after two days floating down the Mekong, there was some rather special behaviour. After we returned to Houay Xai from the Gibbons Experience, we said “Safe Travels” to Tom and Jamie and “See you soon” to Chris and Germaine. The next morning we had an amazing breakfast and got lunch for the boat at BarHow. The owners then offered us free water and a ride to the slowboat dock. 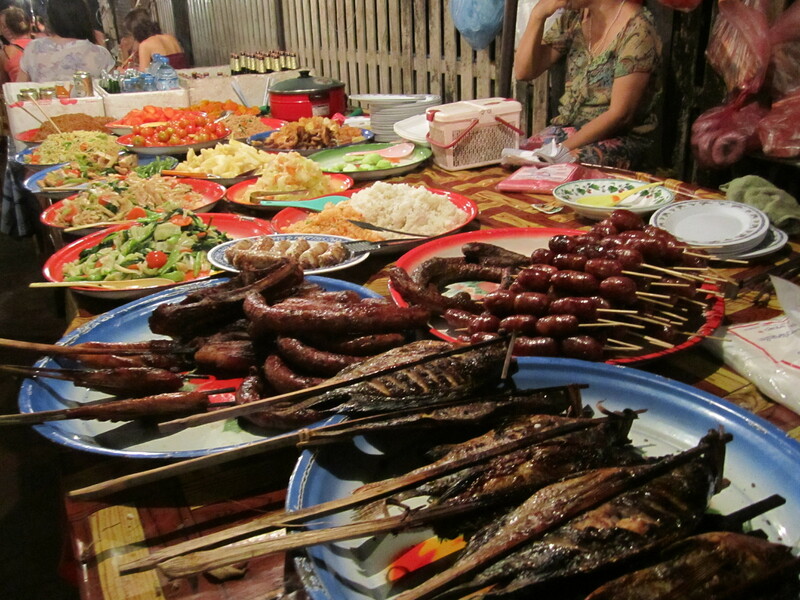 The generosity of the Lao people is incredible. The slowboats are long narrow wooden boats with a walled “hut” at the back. Ours was outfitted with old bus seats and was actually quite comfortable. At this point, I was travelling with one of the Aussie couples from the Gibbons, Tess and Cam. Also on our boat were 4 guys from Amsterdam who were also in the jungle with us. 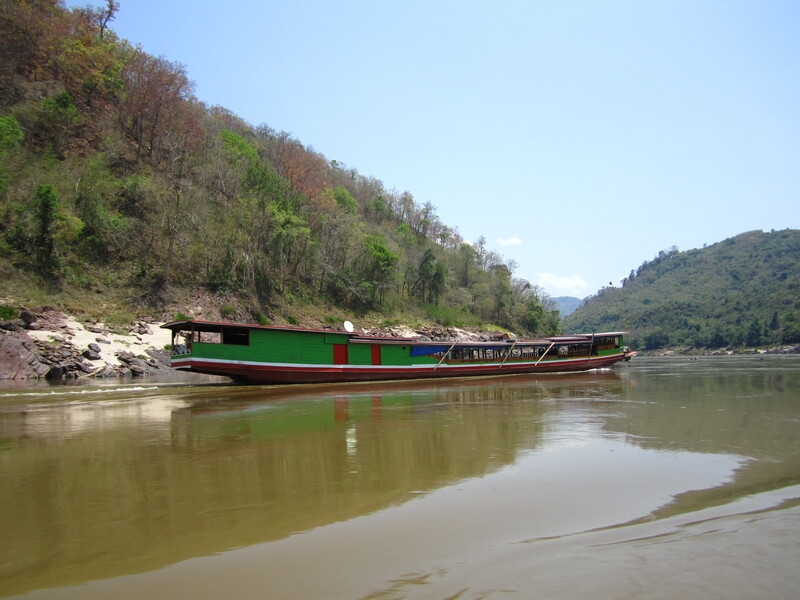 The first day on the boat was about 7 hours of heading downstream to Pakbeng, where we would spend the night. There was a small concession bar at the back of the boat that many people took advantage of and after a couple of hours, a small “spring-break” started up at the front of the boat. This may be surprising to my friends, but I chose to nap and read rather than hit the party. I am so glad I did. The feeling of lounging right at water level with the sun on my face and the hills, beaches and tiny villages passing by was so serene. We passed by groups of women washing clothes in the river and what looked like panning for gold (though I have a feeling something else was going on) while their children splashed around and had a great time. I managed to arrange a roommate for the night in Pakbeng, and it turns out that she was really cool and had me practicing my french on her without laughing (she’s from the south of France).We wandered through the town together, going far beyond the area that most of the visitors saw. There were young girls getting ready for a ceremony, dressed in vibrant silk with gold stupa shaped crowns on their heads. Most of the town doesn’t have consistent power, so many of the people we saw along the way were sitting around in candlelight. It was beautiful. The next morning, we slowly maneuvered our way down the steep bank of the Mekong to get back on the slowboat, bound for Luang Prabang. It was another perfectly clear day, and the ride was smooth and relaxing. 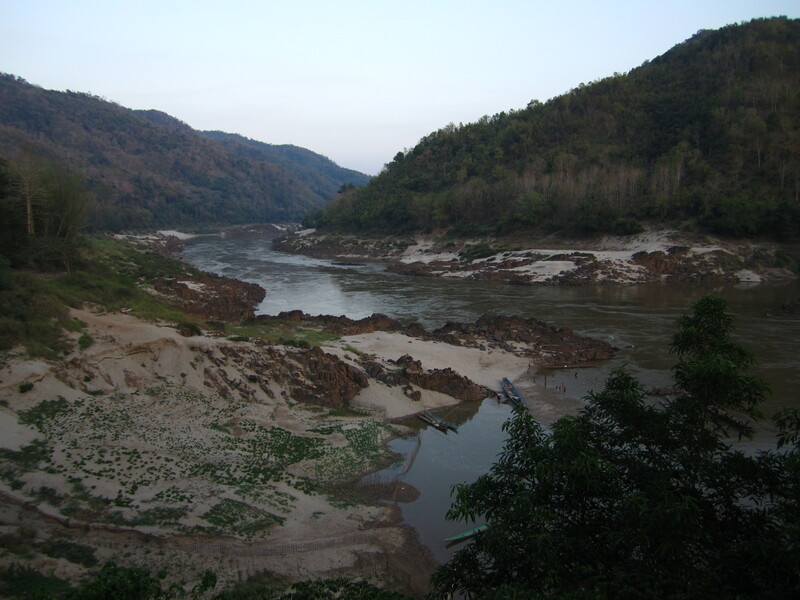 The landscape started to change as we got closer to Luang Prabang, with massive rock faces cropping up out of nowhere. Just before reaching the town, we went past the Buddha cave in the cliff to the right. It is a natural cave that has become the repository for all of the retired Buddha statues from town. 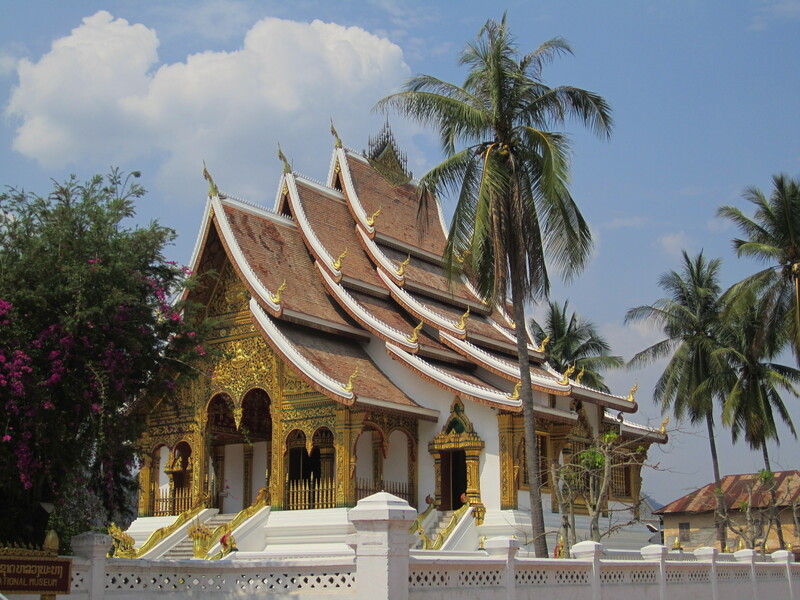 When we arrived on the banks of Luang Prabang, Tess, Cam and I headed off to find a guesthouse. During our wander around town, I was struck by how strong the French influence still is here in the buildings, the restaurants, and even some of the people. 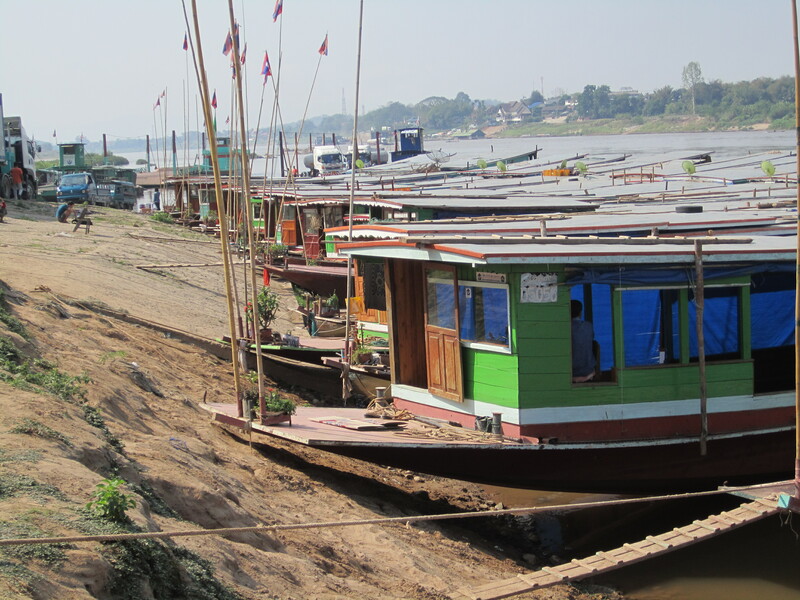 We found a great place facing the Nam Khan river, dropped our stuff and headed dinner and to the night market. The next day, we wandered around the town in the light, had some amazing food, spent some time online. We happened to be wandering near a temple while the monks were playing the drums. 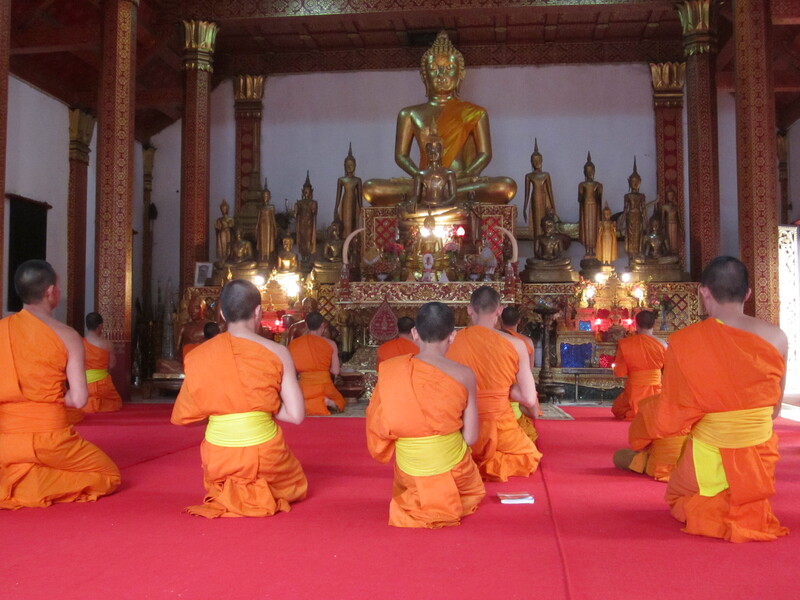 We went to see what was happening and were invited to come back in an hour to join them for their evening chanting. It was such an incredible experience and we all left feeling very relaxed and happy. That night, we went back to the night market and hiked up to the top of the hill in the center of town with a temple on top and an impressive view. The next day we decided to head to the only local waterfall that still had water this far into the dry season. We were dropped at the entrance, next to a bear rescue. It was feeding time and we got to see how good the bears actually had it there. There were many things designed to keep them active and keep their minds happy, as well as to encourage foraging for their food. A short walk from there, we came to the first of a number of pools below the falls. The water was bright blue and felt great! After a quick swim in this pool, we wandered up to the next, where there was a great rope swing and a spot where you could jump off the falls to the pools below safely. It was great fun! 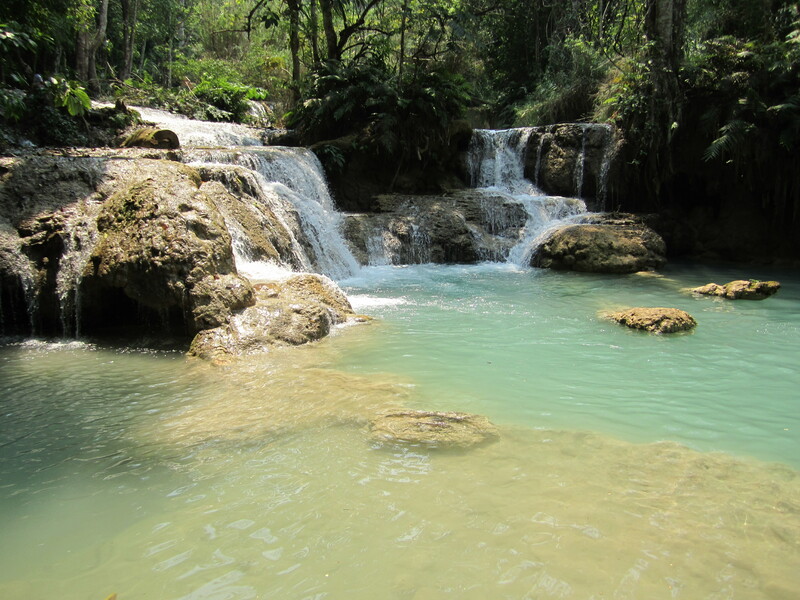 We kept going up and up to more and more pools before finally coming to the highest section of the waterfall. It was absolutely stunning, and once again I had to remind my self that this is real, I am actually experiencing this! Once back in town, we headed back to the night market for dinner. The food section is huge and very very cheap. We ate very well! After another day wandering around Luang Prabang and another trip to sit with the monks while they were chanting, it was time to move on to Vang Vieng. This has been a great town to visit, and I could easily stay here much longer, but I only have a one month visa and have a bunch of places I would like to see. So I’m off for my next adventure! This entry was posted in Laos, Traveling. Bookmark the permalink. Great adventures. The boys here want to know how much a beer costs in different countries, that is how we gauge our envy. absolutely amazing pictures and again some AMAZING experiences!!!! while i was looking through your pictures you made me laugh! oh how i miss you! so VERY glad you are having such an incredible time!